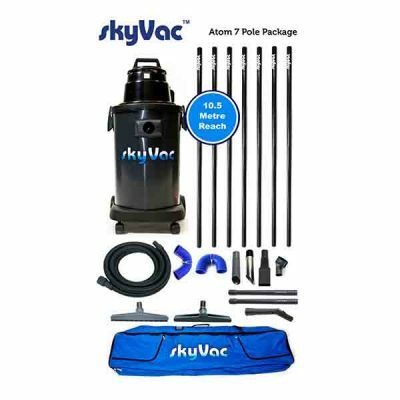 The SkyVac Atom packs a powerful punch with its commercial grade build. Gutter Cleaning, High – Internal Vacuuming. With 2 industrial strength vacuum motors giving huge suction power of 100 inches of water lift. 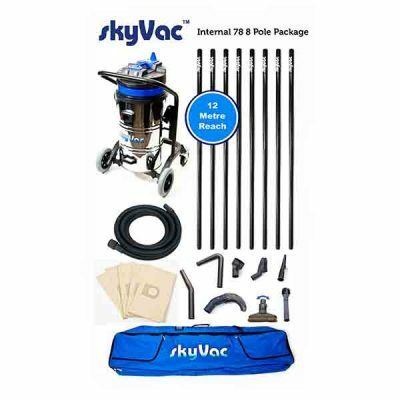 SkyVac Commercial, ideally suited for Gutter Vacuum Cleaning. offers our new Elite Clamped Poles. Gutter Vacuum Cleaning Muscle. requirements. The Worldwide compliant Honda Engine. 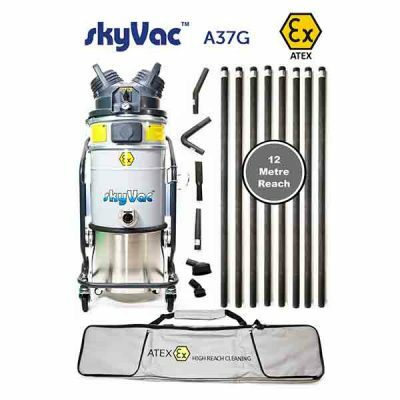 The 27 litre high-level internal vacuuming system for hard to reach areas. The perfect choice for a range of environments, including libraries, offices, stately homes and schools. Complete with telescopic vacuum pole. 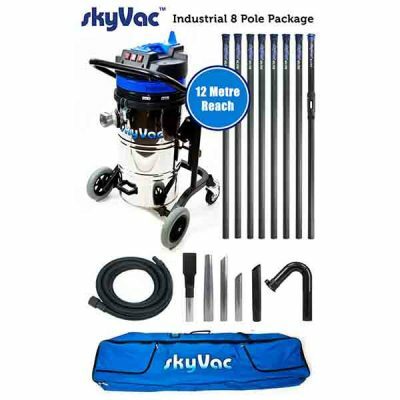 With extremely lightweight Carbon Fibre Poles, a 37 litre capacity and a basket for all your tools and accessories, this high-level system is suitable for all of your internal vacuuming requirements. 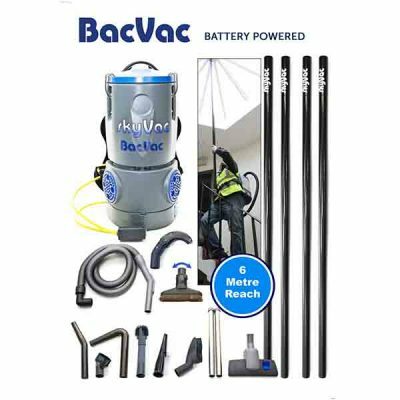 With highly efficient twin vacuum motors and a wet or dry application – This vacuum is the absolute best for all of your heavy-duty, internal vacuuming needs. 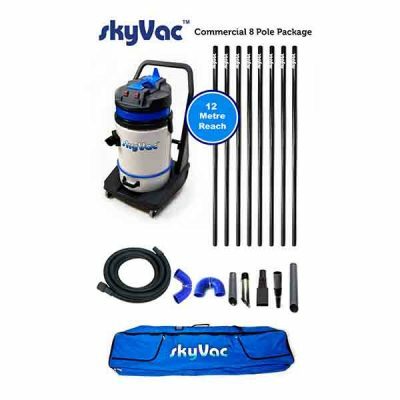 SkyVac Cell enables you to move around freely to gain access to high and low areas. Featuring a small charger battery pack and a high powered motor means it has 80% of the suction o a cable vacuum. The ‘Go Anywhere’ Internal High Reach Vacuuming System is a complete package where you can simply just plug in and go. A tank capacity of 8 litres, a 90 inch lift. 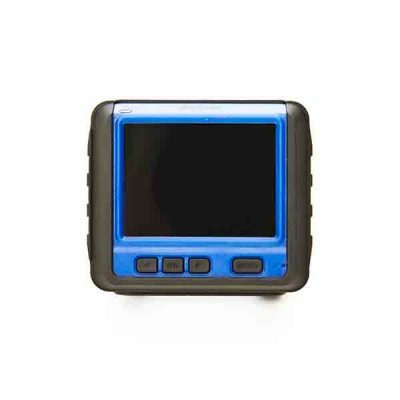 Compact ATEX system suitable for Class M combustible dusts within ATEX Zone 22 hazardous areas. 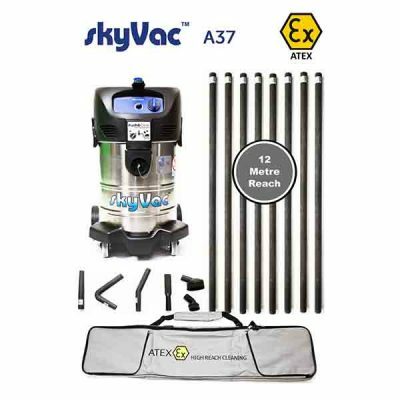 Extremely powerful ATEX system suitable for Class M combustible dusts within ATEX Zone 22 hazardous areas. Utilising the world’s lightest poles at only 186 grams per metre, the robust system can remove the densest of dust. 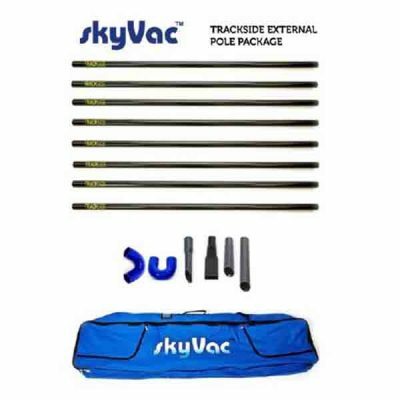 External Pole Gutter Vacuum Kit, Taper Push Fit Poles. Made from non-conductive materials. 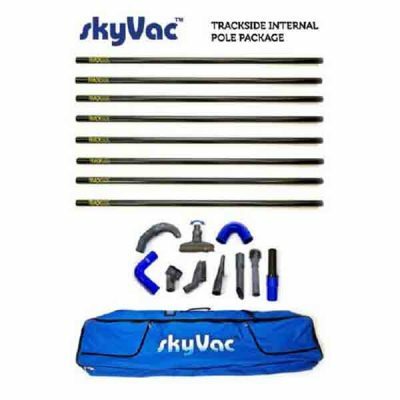 Special Trackside Pole Kits for Railway Industry. Made from non-conductive materials. Special Trackside Pole Kits for Railway Industry. High Dusting and Vacuuming. 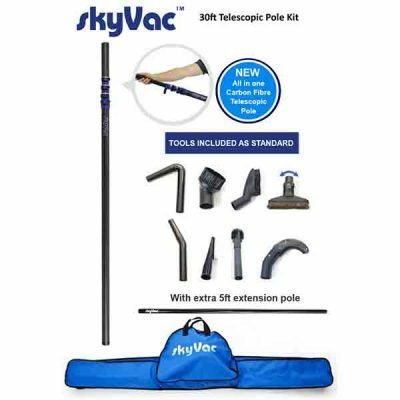 World’s 1st Telescopic Carbon Fibre Vacuum Pole, reaches up to 30ft with a collapsible height of just 5.5ft. SkyCam, high level gutter cleaning. 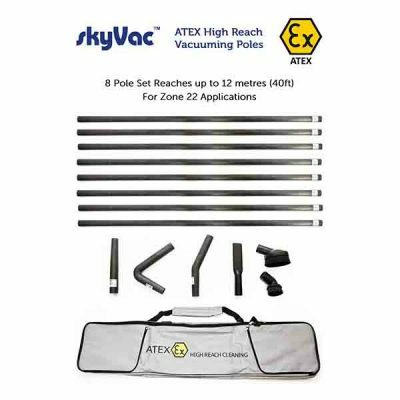 Our light weight Carbon Fibre Inspection telescopic poles are the strongest on the market and can elevate our cordless camera & monitor (sold separately) up to 44ft. 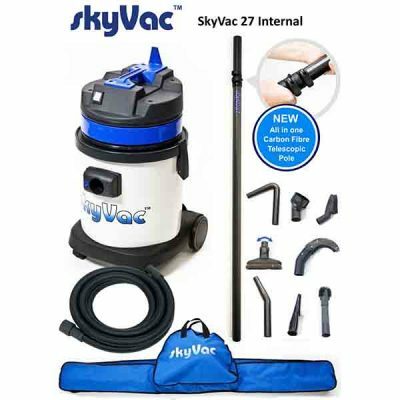 The SkyVac Gutter Vacuum systems and equipment revolutionizes the gutter cleaning method, making the task safer, easier and faster. 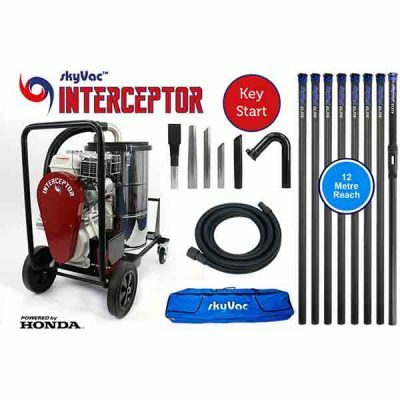 Our gutter cleaning equipment offers users the complete package for domestic and commercial uses. Pole extensions are available in carbon fibre and can be selected in various kit sizes, with the option of different end tooling and goose necks. For extra convenience, our gutter vacuum systems are for sale in three distinct airflow configurations giving you the ultimate choice. The ever increasing requirements for consumers and customers to have gutters cleaned is becoming more relevant. Consumers need to be aware of their local obligations in regards to keeping their home safe from fire, damage and potential insurance claims. 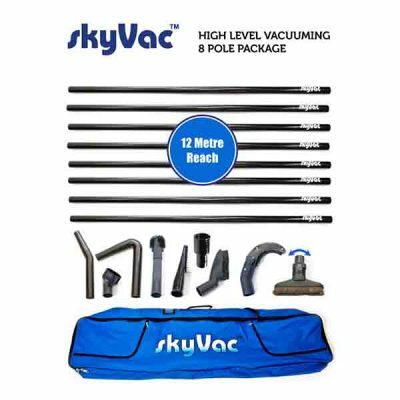 Keeping the operator’s feet firmly on the ground is important when cleaning roofs and guttering, This is made easy with our Gutter Pole Vac Tools and Equipment kits. 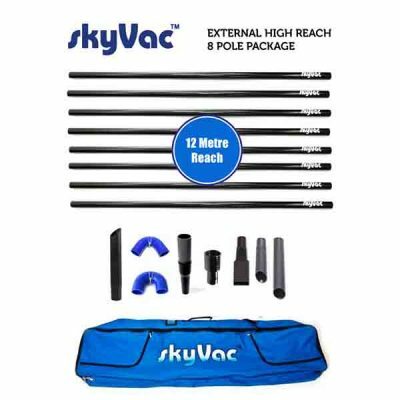 The ability to choose different height carbon fibre pole kits allows an operator to use a 6m, 9m or 12m carbon fibre extensions. With such cleaning tools, users can clean gutters from the ground with much more safety than if they were at a lofty height. The options extend to a selection of kit applications from “full carbon” for general use gutter cleaning, and “Non-conductive” vacuum cleaning poles, for rail track side and or tidying up gutters around power lines. 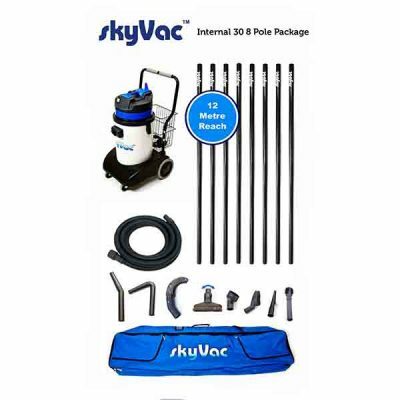 The gutter vacuum systems can be accompanied with internal vacuuming and dusting kits. 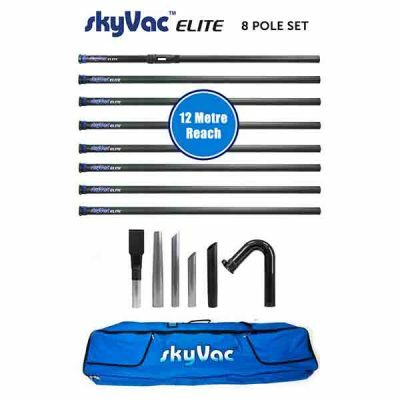 The kits we have for sale contain all of the tools you need including a robust selection of connections, storage bag and carbon fibre poles. Our poles are suitable to connect to various vacuum dusting brushes. 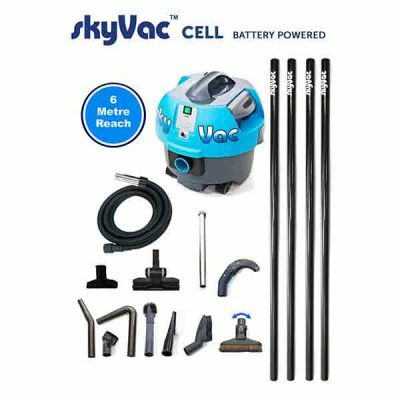 These brush sets along with the suction power from the SkyVac Gutter Vacuums help remove even the peskiest dust and debris. 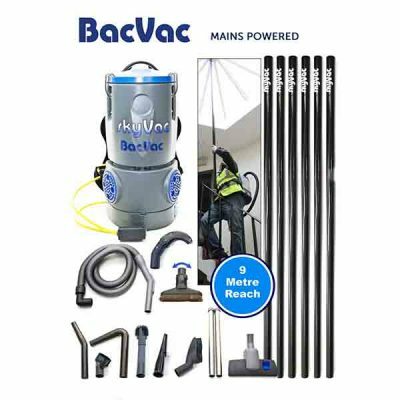 This will allow operators to carry out high internal vacuuming and dusting with the same reach heights and options as our gutters cleaning systems. 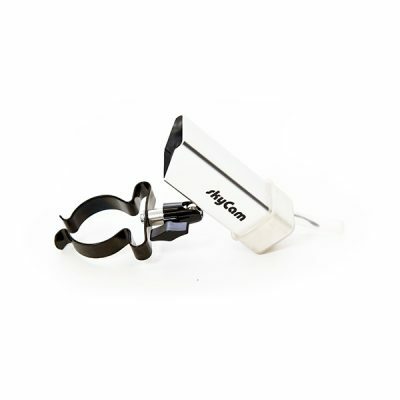 The attachments added to this internal vacuuming kit will allow dirt and dust removal from different profiles, flat and curved with the various attachment components. 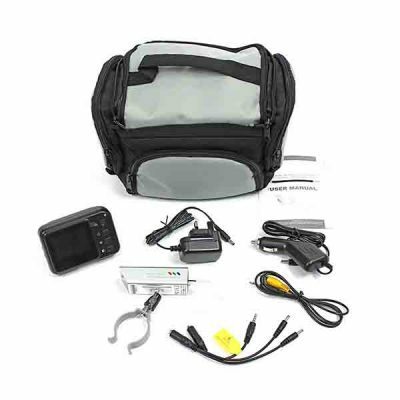 Wireless camera kits are also available for inspection. 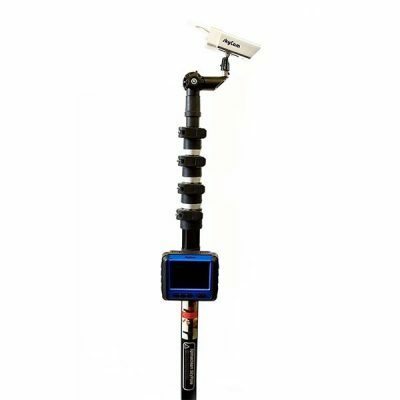 We know your situation could be different from the norm so, if you need something very specific, please contact Ionic Systems directly and we’ll be happy to see if we have it for sale, on all Gutter Vacuums and Gutter Pole Vac Systems both internal and external from Skvac and SpinaClean. It's a fantastic system, it cleans better, the work is easier. As for the winter, using hot water has definitely enabled me to keep working. You could work in 2 inches of snow if you wanted to.